For years Good Jobs First has been warning of the dangers of subsidizing retail development—overbuilding, sprawl, fiscal weakness, creation of low-quality jobs, etc.—so it is reassuring when we see our message starting to get through in unlikely places. Recently, the Montgomery Advertiser published a 2,000-word story that dared to raise some questions about the wisdom of continuing to pile on sales tax rebates and other deals for retailers in Prattville, a suburb of Montgomery that is apparently a shopping paradise. The town, with a population of some 32,000, has added some 1.3 million square feet of retail space over the past three years, much of it for national chains such as J.C. Penney, Best Buy, Target, Home Depot, Circuit City and Bass Pro. It already had other big boxes such as a Wal-Mart Supercenter and a Lowe’s home improvement store. Given the town’s location along Interstate 65, this kind of development was probably inevitable. But rather than letting the market work its magic, officials in Prattville made abundant use of a 2004 change in Alabama law that permitted localities to offer low-cost financing and other incentives directly to developers. 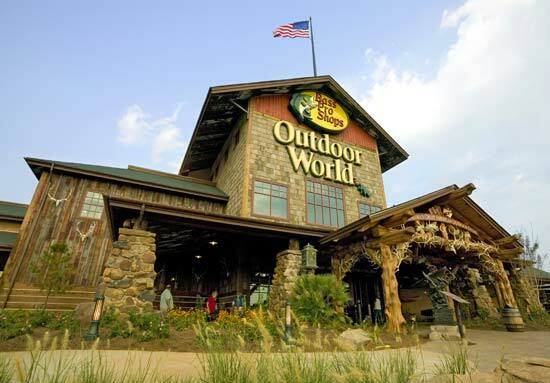 For Prattville this included, for instance, a $23 million sales tax rebate for a Bass Pro hunting and fishing superstore (photo). Alas, Gillespie failed to persuade his fellow council members. A few days after the Advertiser article was published, the council voted 5-2 to approve the new package. I guess the effort to stop retail giveaways still has a long way to go. This entry was posted on November 4, 2008 at 4:52 pm and is filed under Big Box Retail, Subsidies. You can follow any responses to this entry through the RSS 2.0 feed. You can leave a response, or trackback from your own site.